Send a fun, silly, free e-card to family and friends. Just enter their email, your email and hit SEND. You can first enter a personal message or their name or your name, but that’s optional. One of 6 children will sing the e-card. Choose your favorite. You can hit PREVIEW to see what your e-card will look like before sending it. Our free e-cards have no advertising or pop-up windows in them. Please note that the information used by this e-card is never recorded nor stored. If there is one series of toys that my son uses on a daily basis it's Mega Blocks. He plays with them all the time and never gets bored! 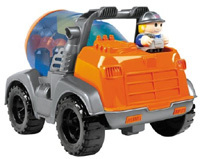 The Blocks and Tiny 'n Tuff Vehicles are easy to put together and just the right size for toddler hands. It's amazing to watch him developing his motor skills while expressing his imagination with Mega Bloks.